A basic programme of several days, workshops, individual coaching and constellation work. The horses direct you in an amazingly true way towards the essence of your message and of yourself. People often feel like they are nothing more than the product of their past, or a plaything of circumstances. We help people to become aware of the unlimited capacity of Creating and of the sense that you really are the captain of the ship that is your life. It is a matter of making choices and giving direction to the consequences of these choices. Will this make life easier? Not always. It will make life more fascinating, richer and more connected, though. Let yourself be taken into the journey of finding your own essence! With the support of horses you can experience how you can become meaningful by establishing unencumbered interaction with your environment. 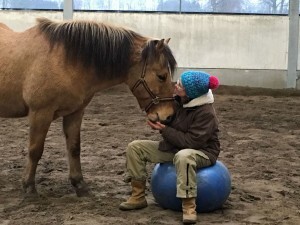 No vague stories, but consistent solution focused guidance, actual experiential exercises, background info, self reflection and valuable practice with the horses (from on the ground). Are you expierencing fear? Are you burdened with uncertainty or dependence? Are you having difficulties to gain visibility? Are you struggling with setting boundaries? Are you in a burn-out and do you need extra support in making things feasible again? Our coachings aim at people who are in search of the power to keep a tight grip on the rudder of their life. Constellation work is a fast and intense process to gain insight in the dynamics of a system (family, organization, society,…). The horses act as representatives, representing resources. By being who they are, they do what they do: in every here and now, a horse mirrors your qualities and your pitfalls.